It seems that inventing a better mouse trap has now turned into inventing a better way to stop smoking. Patches, e-cigs, hypnosis, gum and the old cold-turkey. Rather than a better way to quit, it is clear that the important thing is a better way for you to quit. This is where Kuji Nakano and Ata Ghofrani come in. They figured that if you have a good idea of exactly how many cigarettes you smoke, you will become more aware of your habit and have a fighting chance to kick it. 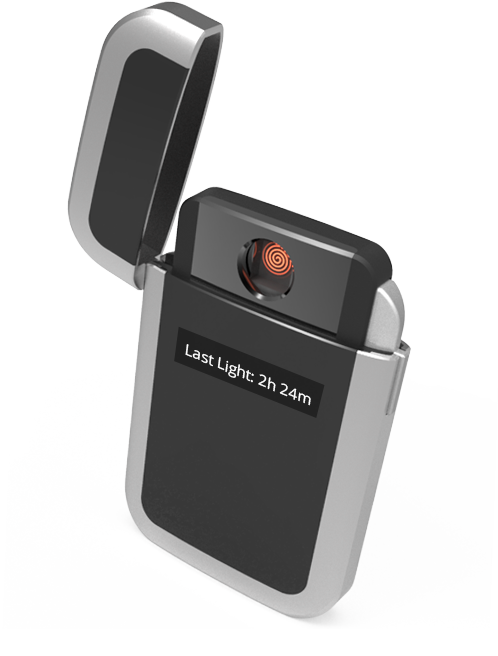 Meet Quitbit – dubbed by me, the passive-aggressive lighter. And I mean it in the best way possible. The concept is simple: Quitbit, a high-tech USB lighter, counts every time you use it, and then tallies it up on a nifty iPhone app. You can see how much and when you smoked, and even share and compete with your friends. It actually makes not-smoking fun! I caught up with Kuji and Ata for a few questions regarding their fantastic new device. Me: What prompted you to start Quitbit? Ata: My cofounder and I are both smokers. While we were smoking one day in Grad School at Brown my cofounder wasn’t sure how many cigarettes he had each day. After trying a ton of different products, we realized that there was no real easy way to know how much we were cutting back. 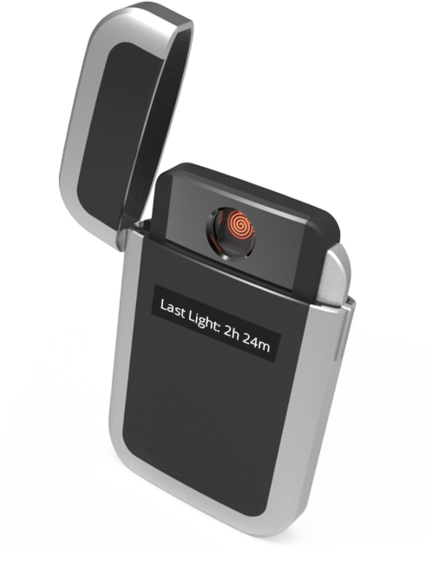 We set out to make an easier way to help ourselves cut back our smoking and then quit, and what we ended up with was the world’s first smart lighter. Me: What makes Quitbit different than other quitting methods? Ata: We like to consider ourselves a tool to help change behaviors. No one product will make someone quit smoking, the motivation comes from within. We provide tools that enable the smokers to understand how much their smoking and learn from their patterns. They can use our tools to help them set custom plans to reduce their smoking and even limit how many times the lighter can work. We encourage people to try other quitting methods in conjunction with the Quitbit if they want and see which one works best for them. Using the Quitbit, you can precisely know how much e-cigarettes are affecting your smoking vs. nicotine gum. Choose which one you prefer, and take positives steps to become healthier. Me: What sort of feedback have you been getting from people who use it? Ata: We’ve tested numerous generations of the product with different group of smokers so far. The response we have been getting has been great. People use it in different ways. Some use the reduction feature and try to reduce outright. Others challenge themselves to extent the time between each cigarette. Some of the smokers realize when they were just smoking out of habit as opposed to when they really wanted a cigarette. Being mindful of their smoking habits has helped people reduce their smoking over a very short period of time. We’re really excited to get the Quitbit into people’s hands and see how they use it for themselves. Me: Does Quitbit work with social media? How? Ata: Social support has been shown to be a very effective way of helping people quit. We have a community feature built into the mobile platform so smokers can share their progress and swap stories to a group of like-minded people. The platform will also be connected to twitter and facebook too, so users can tweet and share their achievements to their friends whom not a part of the platform. Me: At which stage is the product right now? Ata: We’ve completed 4 generations of prototypes and the industrial design is complete. We’ve created the last batch from factories in China. Our prototypes do nearly everything we need them to do, just not in the form factor or quality we require. We need to design for manufacturing, finalize the hardware, the firmware and the app. We’ve also just released a free version of the Quitbit app so smokers can track their smoking and get a taste of things to come (check it out on the app store if you have an iPhone!). We’ve been living in China for the last 4 months already hammering out suppliers and partnering with top tier manufacturers to deliver a really great, reliable product. Me: How can people be a part of it – are you crowd-funding? We’re launching a Kickstarter campaign this Monday on May 12th. We’d love to hear everyone’s comments and suggestions, feel free to reach out to us anytime at [email protected] We need everyone’s help to create a community around this product and would really like to incorporate people’s feedback into features as we’re building. Please go to www.quitbitlighter.com to check out more and signup to be the first to know when we launch!